In the Norwegian Tundra, the Sami Keep their Indigenous Cultures a Head! People Without Borders in the Norwegian Tundra! The Norwegian tundra is one of the beautiful sites in the world. It is rich by nature and it spreads to cover 32% of 307,860 square kilometres total land area in Norway. Some parts of the tundra are good for summer pastures. The plants become smaller and mosses and lichens are more predominant when the land spreads to the heights. The following lines are about the most important residents of the north Norwegian tundra. If you found it useful, please share it. If you know more information about it, use the form at the bottom of the page to share it with others. Thanks. The plants cover most of the ground even if the snowfields last into mid summer and permafrost are common. On the highest, the ground is dominant by bare rock, snow and glaciers, with few plants. The tundra is always part of the Arctic Desert. The Sami people live in the bare, cold tundra in northern Scandinavia. Those people are nomadic reindeer herders whose lives are shaped by the movement of the reindeer. The snow and the wind conditions determine in turn the movement and the route of the reindeer flock. The Sami people can spend up to nine months of the year in the mountains. The Sami is believed to be one of the last indigenous groups in Europe. They live in Sapmi, an area that crosses the borders of four countries. Their territory stretches from central Norway and Sweden across the north of Finland to the east of the Kola Peninsula in Russia. The exact number of the Sami people is unknown. However, some sources estimate the numbers of Sami who live in Sapmi between 60.000 and 70.000. Most of those people live in Norway. The Sami has more than 400 words for reindeer, used to describe gender, age, colour, shape, etc. Although relatively only a small percentage of the Sami are now living a traditionally reserved Sami-life, so reindeer herding remains an essential part of their culture. Shepherds have irreplaceable and invaluable knowledge about the mountains and the snow-covered landscapes of the Nordic countries. Due to climate change, so their traditional means of knowledge is no longer as reliable as it once was. Rising temperatures and mild winters have made the ice unsafe, and forests have spread into the reindeer grazing areas. In winter, the rain falls instead of snow, posing new problems for the Sami and their herds. When the rain hits the cold ground, it forms an extra layer of ice that prevents reindeer from reaching down to the low, as they feed. The Sami are already living with the challenges thrown up by the global warming. The anticipated future rise in global temperatures poses a serious threat to both the reindeer and the Sami identity. Have you been at Norwegian Tundra? Do you know more information about the Norwegian Tundra or the Sami and other groups there? Use the form below and let's know more. 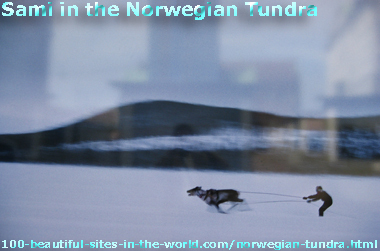 Well, please share this page about the Norwegian Tundra with your services through the following buttons. If you do not have a service there, you can register for one and enjoy this kind of technology and social networking. Thank you. "Solo Build It" at the bottom bar empowers this page about the Norwegian Tundra, by strong website building and optimizing tools. Thanks to "Solo Build It".